Finance example: Opel Mokka X SC 1.4 Turbo (140PS) Start/Stop ECOTEC. Retail Price† €25,295. Customer deposit / Trade In €7,588.50. Finance Amount €17,706.50. 36 monthly payments of €525.51. Fixed APR (Annual Percentage Rate) 4.9% as at 01/04/2019. Minimum deposit 30%. †Excludes delivery and related charges. Model shown for illustrative purposes only. *Lending criteria, terms and conditions apply. (>18s only) To qualify for this Finance Offer; minimum deposit of 30% of the Total Retail Price and a maximum term of 48 months apply. Rate quoted is correct as at 01/04/2019 and is subject to change. 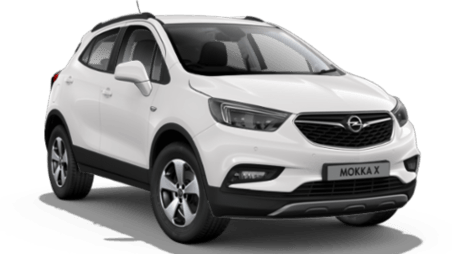 Offer available on all new Opel Mokka X retail passenger cars models ordered from 01/04/2019 and registered by 30/04/2019 at participating Opel Dealers. This is a Consumer Hire Purchase agreement provided by Bank of Ireland trading as Bank of Ireland Finance. Ownership remains with Bank of Ireland until the optional final payment is made. Mokka X Fuel Economy I/100km: combined 5.6-8.3, CO2 emissions combined 145-188 g/km.